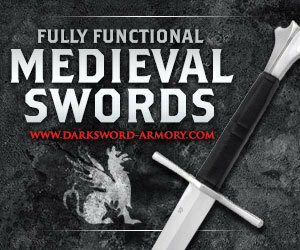 The Tactical Battle Ready Ninja Swords of the Ontario Knife Co. 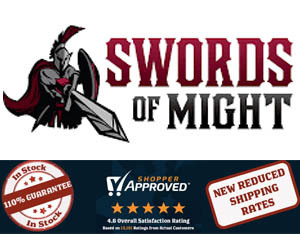 DISCONTINUED: Unfortunately this sword has been discontinued for some time now and is not available for purchase, however the review has been preserved for informational purposes. 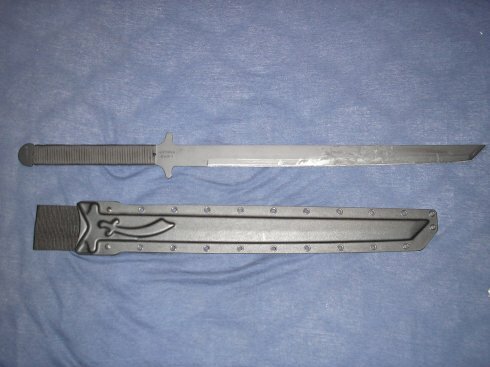 Most tactical battle ready Ninja swords on the market are extremely poorly made. I have always wanted a sword, ever since I was a little kid. I even started making one when I was nine, using a piece of scrap metal. Alas, I was defeated by lack of tools and muscle power. But the dream remained. In college I spent a year on the fencing team and enjoyed it immensely. But life and family responsibilities came along and I put away what I considered childish things. Twenty years later a heart attack out of nowhere reminded me that all work and no play makes a dull boy. A very dull boy, in a very dark box. My sawbones prescribed light upper body exercise with an emphasis on stretching and building endurance. After a few mournful weeks of cranking that dang overhead bicycle wheel and hefting small weights, the light bulb finally lit. I decided to get myself a sword and see how much I remembered from my carefree days of yore. Saber was my weapon of choice way back when. But I needed a way to stretch both arms and my whole upper body. After reading up on things, I was surprised at how familiar some of the basic Japanese fencing moves appeared to be in relation to the saber techniques I vaguely remembered. So I figured I would get a katana and see if I could keep from killing myself with it. All kinds of options presented themselves, but few of them met my requirements. First, it had to be as cheap as possible. 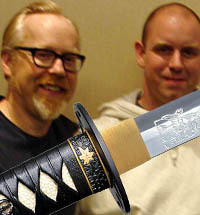 Second, it had to be a real sword. Third, I wanted something made in America if possible (gotta support the home team). Fourth, I didn't want anything too fancy. I plan to move from basic stretching exercises to whacking real things with it, like bushes and trees. Fancy would just get in my way. I hunted all over and finally ended up settling on the Black Wind katana, one of the battle ready Ninja swords made by Ontario Knife Co. in upstate New York. 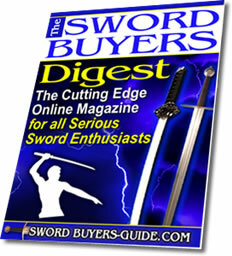 Obviously, these battle ready Ninja swords are not true "katana" in the usual sense of the word. 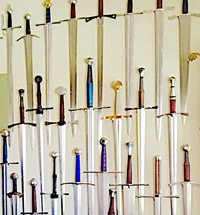 But since I am a beginner at the art of sword collecting and not a purist anyway, it is close enough for my purposes. 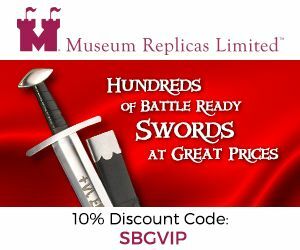 Ontario Knife Co. does not list on their site the exact steel for these Battle ready Ninja swords, but I have read from researching other sites that they are constructed from 1095 steel. 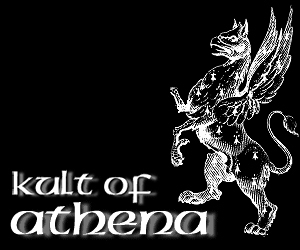 All I can say for certain is that they are doggone tough, which I will expand on in a minute. The construction of these battle ready Ninja swords is as simple as it can be. There is a slab of metal. 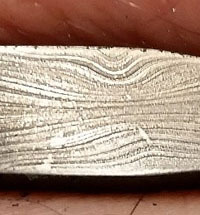 There is a length of paracord wrapped around one end of the slab of metal. There is a coating of black paint. That's it. 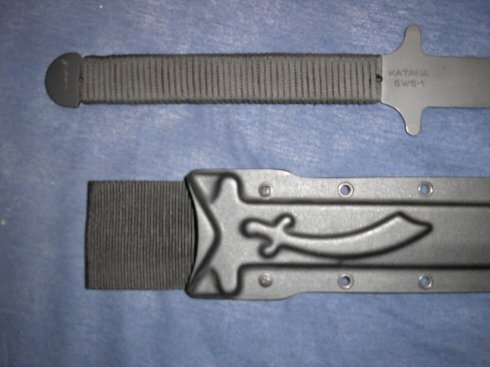 The sheath is kydex, with a nylon belt loop attached and two additional loops on the back of the sheath (in case someone wants to fasten it over their shoulder or onto a pack). Heat tempered and razor sharp on arrival. Flex range unknown, since it was too tough for me to flex it very far. I just didn't have the muscle to bend it more than 6-7 degrees out of line before it snapped back into line. 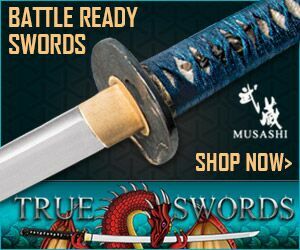 In short these battle ready Ninja swords are very hard, very stiff and very strong. These battle ready Ninja swords are not wall hangers. This sword was not designed to look pretty, this blade was intended for one purpose - to swing at whatever is placed in front of it and separate it into sections. No one is going to look as graceful as a crane while they waltz through a kata with this sword. This thing is as ugly as a mud fence. It is a pure bred weapon. Functional, efficient, hard, effective, and just as ugly as the purpose for which it was designed. The whole concept of making a killing tool into a thing of beauty has always bothered me anyway. I don't have that problem with this sword. Ontario put all of their design efforts into function. Form simply followed naturally along. Handle: Paracord wrap, double layer. Solid grip with a very tight wrap. Two holes drilled in the tang would make it a simple matter to affix a custom handle if anyone chose to do so. One of my personal quirks is that when is comes to tools or weapons, I refuse to own crap no matter how much I paid for it. If it doesn't meet my standards, out it goes. So I needed a real test of this blade. Fortunately I had a perfect test subject right outside the back door in the form of a frozen and dying peach tree. Time to do some severe pruning. Before I took the sword outside though, I decided to check the edge to see how well it had handled being used on the cardboard shipping box. I picked up the shipping invoice and used the blade to slice it neatly as a straight razor. Yup. Still sharp. Just for overkill I ran a kitchen steel across this battle ready Ninja swords edge. Then I gingerly tested the edge with my thumb and flinched. It was frighteningly sharp. I proceeded outside and snipped off a few smaller limbs the size of my thumb effortlessly. Bear in mind that this peach wood was half dead, in mid-winter, in sub-freezing temperatures. The stuff is hard. 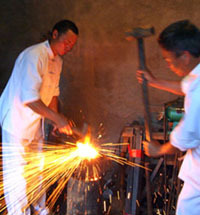 This is NOT equivalent to slicing through a wet mat or snipping a sprig of green bamboo. Dead and frozen peach wood is a bit firmer than green bamboo. Finally I decided to bite the bullet. I picked out a limb the size of my forearm and started chopping. 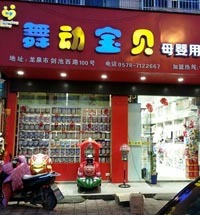 Since I am not in what any honest person would call good condition, it took me a while. This picture shows the results. Please note that I used the same section of blade, approximately one third to one half down the length from the point, to slice the paper that I had been using to cut the wood. Yes. 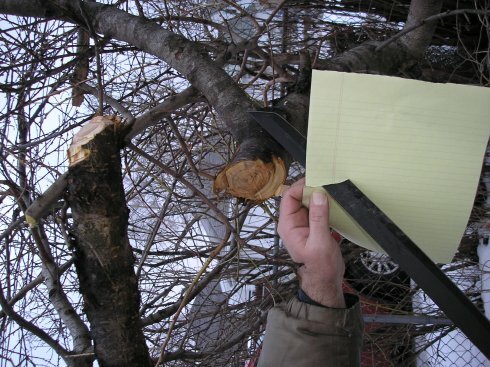 I chopped through a three inch thick frozen tree limb, then used the same length of sword blade to slice a piece of notebook paper. I think I got my money's worth. To each their own, but I am not complaining.